A tech start-up wants to take advantage of the public’s lack of faith in the MTA and DOT’s plan to keep transit riders moving when the L train shuts down. Dubbed, “The New L,” which popped up on Twitter yesterday, the company is advertising “luxury shuttles driven by professional chauffeurs” for $155 per month. By poaching bus riders, the service is almost guaranteed to make the whole transportation system slower and less efficient, much like Uber and Lyft do in central cities. The “New L” scheme preys on DOT’s timid mitigation approach, which won’t give buses an exclusive lane on the Williamsburg Bridge during the shutdown, but merely restrict the bridge to buses and vehicles with three or more passengers [PDF]. The plan also maintains the status quo on the three other main East River bridges, despite expected volume increases as drivers seek other routes. Of the L train’s 225,000 riders who cross under the East River, the vast majority will be diverted to other subway lines. Of the remainder, DOT and MTA expect a few thousand to opt for ferries or bikes. The rest, about 30,000 daily riders, are expected to take the MTA’s “L-ternative” shuttle service. At peak times, the MTA is planning to run 80 buses per hour over the bridge. Add local traffic, trucks, liveries, and other vehicles, and the buses will be totally stuck, according to J.P. Patafio, who runs the surface transit division of the TWU Local 100, the MTA’s largest union. 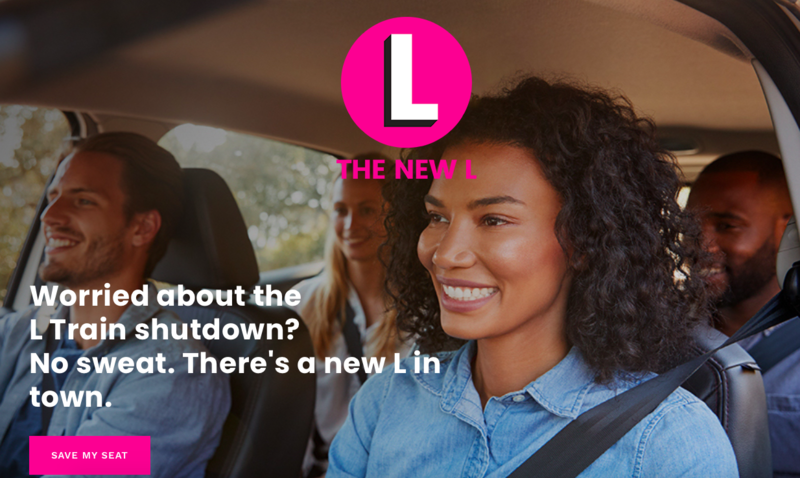 The homepage for “The New L” shows happy people in a car (with the steering wheel on the wrong side). He said the existence of “The New L” and other pop-up livery services demonstrates the need for the DOT to give buses even more priority on the Williamsburg Bridge. The MTA can pull out all the buses and operators it has, but Patafio said it won’t make a difference if those buses don’t get priority. The logic extends past the bridge onto Grand Street, which will carry the bulk of displaced L train riders who end up on buses. On Grand, DOT is planning to install a westbound bus-only lane, but local access will still be permitted. Streetsblog reached out to The New L for comment, but did not receive a reply. I can’t imagine jostling around in a van with a bunch of people all munching breakfast being appealing. Then again, they absolutely have a point about the lack of alternatives being a disaster. I feel that way every time I hear anything proposed. The only viable alternative that had a prayer of solving the immediate problem was new tunnel paralleling the L Train. An ugly, expensive solution that we kind of barely had time to do if we had started back when we learned there was a problem (which was 2013 at the latest, if I recall). Unfortunately the principle of “let no crisis go to waste” only attracts vultures these days.